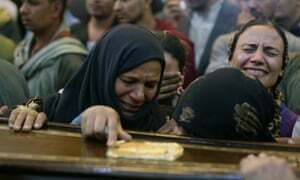 Angry Coptic Christians on Saturday buried relatives shot dead on a bus carrying pilgrims south of the Egyptian capital, the second such jihadist attack on the country's main religious minority in as many years. The Islamic State (IS) group said it was behind Friday's attack which killed seven Christians returning from a visit to the desert cemetery of Saint Samuel that was also targeted in 2017. A security source said another seven people were wounded in the shootings near the city of Minya. Hundreds of angry Copts gathered in and around Minya's Prince Tadros church from dawn for the funeral of six victims, under heavy guard by masked security personnel. The seventh victim, an Anglican, was buried Friday evening in a village outside Minya.